I wrote last week about some of the unusual place names in the City of London, and how they came to be named. This week, I’ve included some more of the weird street names. The way that places get their names has always fascinated me. I lived in the City of London for about six months, once upon a time, and had time to walk around the little streets and alleys. I was fascinated by some of the strange little names, and wondered what the origins were. I was caught out more than once when I thought I could work out the origins, but have learned a lot about the City researching this article. Mark Lane was originally called Mart Lane; it was once a public market. English poet John Milton’s friend, Cyriac Skinner, was a merchant here. There was once an underground station of the same name, which opened in 1884. It was renamed Tower Hill in 1964, but closed three years later. Middlesex Street was formerly called Petticoat Lane, which is how it is still commonly known, famous for its street market. The street market is actually two markets: Wentworth Street, which is open six days a week and “the Lane,” or Petticoat Lane, which is open only on a Sunday. In Tudor times, it was known as Hogs Lane, because City bakers were allowed to keep pigs just outside the city walls. By the 17th century, the area had become known for second hand clothes. The Lane is close to Spitalfields, the area in which the Huguenots lived when they first came to England, fleeing persecution in France. It is one of the oldest street markets in England. Newgate Street. When it was still a walled city, there were seven gates to the City of London (six back in Roman times) and Newgate was one of these. In Roman times a road led from here to Silchester in Hampshire. (It was common for main roads to lead outwards from the City gates, which is why so many of our A roads in Southern England radiate out from Central London.) Many excavations have taken place in the City, and these have uncovered the old Roman structure. From the 12th century, the gate was also used as a prison, as most of the city gates were - William Penn and Daniel Defoe are both said to have been residents at various times. The prison was later extended onto the site of what is now the Old Bailey (see below). The gate was demolished in 1767. Nicholl Square. The Earl of Shaftesbury had a mansion in what is now 37 and 38 Aldersgate Street. The gardens of this house were in what is now Nicholl Square. It is believed to have originally been called Red Cross Square and the name was changed to Nicols Square, probably after the person who owned the land, or the person who built on the land. It eventually became Nicholl Square. Old Bailey is the name of the street in which the Central Criminal Court, or CCC, stands. The court is now commonly known as the Old Bailey, or the Bailey. 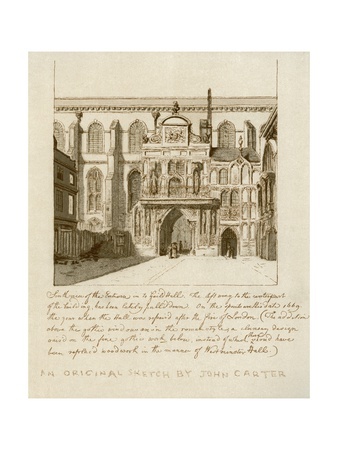 The court, in medieval times, stood next to Newgate Prison, although later, when the prison was demolished, the court took over the whole site. It was actually renamed the Central Criminal Court in 1834, and its jurisdiction was extended to the whole of England and Wales for major trials. Until 1868, public hangings outside the court were commonplace: those condemned – and remember, in those days, the death penalty was not just for murder – would walk along Dead Man’s Walk, between the court and the prison. This was a public walkway, and the public would regularly throw rotten fruit and vegetables (or worse) at the prisoners. Before leaving the Bailey, I must mention the statue that stands atop of the court – she is a bronze of Lady Justice holding a sword in her right hand, and the scales of justice in her left. The statue is intended to depict blind justice, but the bronze is not blindfolded, as statues of Lady Justice often are. Old Jewry. England has always been accepting of foreigners, although this hasn't always me with universal approval. Jews were encouraged to come to England from at least Norman times, when William the Conqueror was king. In fact, this was the first great influx of Jews to England. Old Jewry was a Jewish ghetto until, in 1290, the Jews were expelled from England (very welcoming!!). Part of the reason related to the special status conferred on Jews by the king, which served to put a wedge between them and the rest of society. The Jews didn’t return to England until the seventeenth century, but, nonetheless, the street name has remained. Pancras Lane. This street takes its name from the church of St Pancras, a church built first in the 12th century. The church was destroyed in the Great Fire of London, and was not re-built. Panyer Alley. Quite a strange-sounding name, don’t you think? 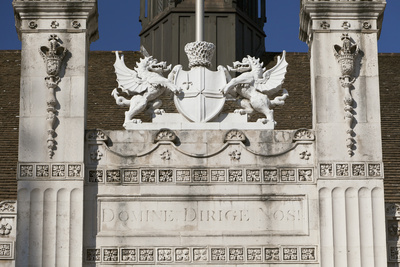 Sixteenth century historian, John Stow, said that the street took its name from a frieze depicting a baker’s boy sitting on top of his bread basket. In the Middle Ages, Panyer Alley was in the heart of the bread making district of London, and this plaque was on the wall of one of the houses. The plaque bears an inscription which says, “When ye have sought the City round, yet still this is the highest ground. August 27, 1688.” This little phrase has caused all sorts of controversy amongst historians – it seems it was never situated at the highest part of the City, so why did it say so? That’s a puzzle we won’t get to answer but the plaque is now situated above the steps of St Paul’s underground station... Take a look next time you go there. Paternoster Row. Paternosters = Our Fathers, and this little street get its name from something to do with this. It is either because medieval monks used to walk along here chanting the Lord’s Prayer, or, because street sellers sold, amongst other things, paternosters. It went on to become an area for merchants of lace and haberdashery, and even later became home to book-sellers and publishers. Queenhithe. A dock existed here from Saxon times, which is where the “hithe” part of the word comes from. It became known as Queenhithe or Queenhythe when the daughter of King Henry 1, Princess Matilda, was granted duty on goods landed there. It is most recently famous for the City end of the Millennium Footbridge which leads to Bankside on the South Bank. Queen Street. This is one of the streets that was built after the Great Fire of London, the other being King Street. They cut across the older thoroughfares in the city. Simply named after the Queen and the King, so no mystery here. Roman Bath Street. Talk about misleading! As so many places are named after events from history ,you'd be forgiven for thinking that there was once a Roman Bath here, but there is no evidence to support this. As far back as the eighteenth century, it was known as Royal Bagnio Court or Bagnio Lane, to give it but two of its names. The name changed to Bath Street in 1843. There were, indeed, baths here, but they followed the Turkish style of baths, rather than Roman Baths. Rood Lane. 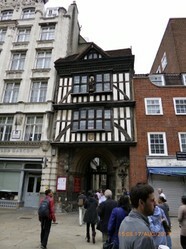 Near to Fenchurch Street, Rood Lane is so called because of the rood – wooden crucifix – that was placed in the churchyard of St Margaret Pattens whilst the old church was rebuilt. The street was previously called St Margaret Pattens Lane and The Lane of St Margaret atte Patyns. Some reports say that pattens were sold there too. Swan Alley/Swan Lane. Sorry to disappoint, as this is another one that has the potential to be very exciting, but it seems to be named after the sign on the tavern, The Swanne on the Hoop. Throgmorton Street runs between Lothbury and Old Broad Street, and is believed to have been named after Sir Nicholas Throckmorton who was the chief banker during the reign of Elizabeth 1. Sir Nicolas is believed to have lived in the area, and is buried in the churchyard of St Catherine Cree. Nearby is Tokenhouse Yard, which is named after the Mint House. This was built during the reign of Charles 1, on the site of a mansion owned by the twentieth earl of Arundel. The Mint House was where tokens known as farthing pocket pieces was delivered. These coins were issued by a number of London tradesmen as copper coins were not permitted in England until 1672. Union Court, Holborn. This street was originally named Scroop’s Court, after the Scropes of Bolton who had a townhouse here. Scroop is the way the name is pronounced. The family can be traced back to the Norman Conquest. How it came to be known as Union Court is unclear. Victoria Avenue is a little street off of Bishopsgate. So small that it hardly merits the term Avenue. The origin of its name is not clear, but it’s likely that when the buildings in the street were modernised, the old name was lost and the avenue was named after Queen Victoria. Walbrook is an underground river in the City and gives its name to a street. It was covered over between 300 and 400 years ago. Sir Christopher Wren lived at 5, Walbrook, for a number of years. Watling Street. Although I remember being taught that this was a Roman Road, it actually pre-dates the Romans, and was a route used by ancient Britons, possibly for travel between the cities of Canterbury and St Albans. The Romans paved over some of the road and it became Watling Street, leading from London to Dover. Much of it is now the A2. Ha ha! That Watling Street took a really circuitous route didn't it? Yeah! Part two. I did say I liked that threat! There's a Watling Street in Milton Keynes too, which is part of the same ancient trackway heading south east towards London.